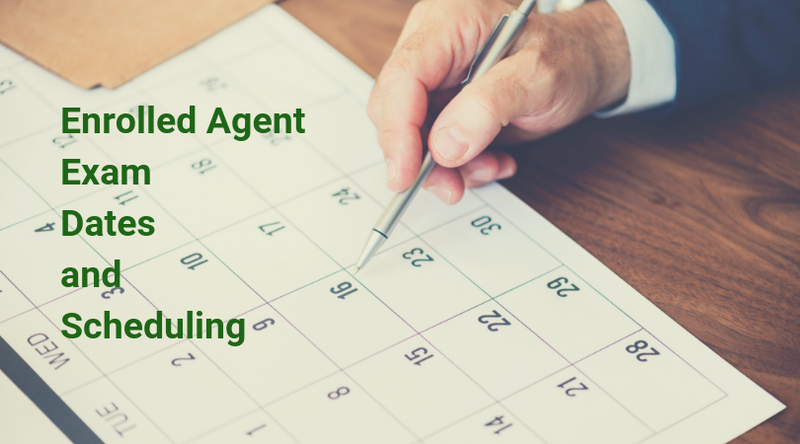 Once you decide you want to purse the enrolled agent (EA) designation, you’ll need to know the Enrolled Agent exam dates. This information is necessary for scheduling the exam (officially called the Special Enrollment Examination (SEE)). Knowing the EA exam dates also enables you to fit the studying and testing process into your life. I’ll cover the EA exam calendar with you and help you navigate the exam scheduling process so you can check one more thing off your list for EA success. Like most professional accounting certification exams these days, the Enrolled Agent exam is completely computerized. Prometric testing centers administer the exam, and they are open every day of the week for long hours each day. Therefore, we have more exam scheduling freedom these days than we had in the past. The Enrolled Agent exam 2019 is available for testing during 10 out of the 12 months, so you can sit for the EA exam on 304 days of the year. The Enrolled Agent exam testing window runs from May 1 to February 28 of the following year. During leap years, the testing window lasts through February 29. During the Enrolled Agent exam blackout months of March and April, the exam administrators conduct maintenance and update the exam for the most recent tax law. How long do you have to take the Enrolled Agent exam? Once you register for the EA exam, you must schedule a testing appointment for your first exam part within 1 year. However, you can take the parts of the EA exam in any order. Once you pass an EA exam part, your credit for that section will last for 2 years from the date you passed. With this deadline in mind, you should plan to pass all 3 parts within 2 years. That way, you can avoid losing credit for any passed parts and having to take them again. For example, if you took Part 1 in January 1, 2019, and then Part 2 in February 15, 2020, then Part 1 will expire on Jan 1, 2021, and Part 2 on Feb 15, 2022. After the deadline, you will have to retake that part of the exam. In the event that you don’t pass an exam part on your first attempt, you may take that same part up to 4 times in a testing window. If you need to take the failed part a fifth time, you will have to wait until the next testing window to sit for it again. The Enrolled Agent exam has no education or experience requirements. Consequently, the only thing you need to register for the EA exam is a Preparer Tax Identification Number (PTIN). Create an online account: This will involve supplying your name and email address. You’ll also need to set up a security question. After you receive your temporary password, you must log in again so you can change your password. Fill out the application: To do so, you must gather and input information about yourself, your business, your tax returns, your criminal history (if any), and your certification status (if applicable). Receive your PTIN: After you finish the online application, you’ll be able to find your PTIN online. Once you’ve acquired your PTIN, you must schedule your exam at your preferred Prometric testing center. The IRS has appointed Prometric to administer the Enrolled Agent exam. Prometric runs exam centers in the U.S. and other countries around the world. Accordingly, they also administer many types of both accounting certification exams (like the CPA and CMA) and non-accounting related certification exams (such as those for nursing and real estate). Click the “Create An Account” button in the “I Want To…” box. Click “Create Account” in the login box to set up your user ID and password. Open the email you will have received from Prometric, click the confirmation link, and activate your account. Then, log in at the Prometric website and enter your personal information, such as your PTIN. Click “Save and Continue” to finish your registration. Click the “Locate a Test Center” button. Select your country and state from the drop-down menus. Then, choose which exam part you would like to schedule (SEE Part 1 Individuals, SEE Part 2 Businesses, or SEE Part 3 Representation, Practices, and Procedures). Search for the testing center nearest you by entering your zip/postal code or your address and city. Check the availability of your preferred testing center by selecting a date on the calendar, clicking “Schedule an Appointment”, and following the prompts to schedule your appointment. Or, use the contact information to call the testing center and set up your appointment. Follow the prompts to choose your exam part, testing location, and appointment date. Pay the testing fee ($181.94 per exam part) by credit card. Or, pay with an electronic check if desired by scheduling over the phone. Finally, receive, record, and keep your appointment confirmation number. You will use this number to reschedule, cancel, or change your appointment in any way. For the EA exam, Prometric allows you to schedule as late as 2 days before your preferred exam date. Nevertheless, I suggest you schedule your Prometric EA test appointment a few weeks in advance so that you’re more likely to secure your preferred time slot. If you prefer Fridays or Saturdays for all your EA exam dates, you should schedule at least 1 month ahead of time. As you can imagine, many candidates wait until the last minute to schedule their CPA Exam test dates. Accordingly, the first 10 days of March, June, September, and December can get very full. Consequently, you must consider the CPA Exam blackout dates when scheduling your Enrolled Agent test dates. After you set your EA test dates, you will receive a confirmation email. This email will include your EA exam date(s) as well as the time and location. Without delay, you must make sure that the registered name and Enrolled Agent exam dates and details are correct. For fear that exam candidates would lose this email, Prometric allows you to request a duplicate confirmation. To do so, you just have to log back into your Prometric IRS account. At that point, you can see how to get the information you need in the dashboard. In the event that you can’t make your originally scheduled Prometric Enrolled Agent exam appointment, you might be interested in getting a refund or rescheduling your exam. In that case, I have bad news and good news. The bad news is that refunds for your Prometric EA exam appointments are not available. The good news is that you can reschedule your EA exam dates for free if you do so at least 30 calendar days prior to your appointment date. If you reschedule your Enrolled Agent Prometric testing appointment between 5 to 29 calendar days beforehand, you must pay a $35 administration fee. You must pay another full exam fee if you reschedule your testing appointment with less than 5 days’ notice. What does a Prometric EA exam testing center look like? Basically, these centers consist of a registration area and a room with rows of computer workstations. Additionally, the format of your name on your ID must match the format of your name on your Prometric registration exactly. Once the Prometric staff has signed you into your appointment, they will provide you with a locker. At this point, you must store all of your belongings in this locker, including your phone, wallet, notes, food, and water. You can bring certain items with you into the exam room, but you must leave other items in your locker. Furthermore, Prometric will give you particular materials to use for your exam. If necessary, you can take a water or bathroom break during the exam. In this case, the exam timer does not stop running and checking in and out of the exam room eats up extra time. The amount of time you need to prepare for the Enrolled Agent exam will affect when you can schedule your Enrolled Agent exam dates. Therefore, you should learn more about how long it takes to become an enrolled agent. You can also get more insight into the format of the Enrolled Agent exam and the Prometric EA exam testing appointment regulations in preparation for exam day. If you’d like even more help with your EA exam schedule, you can just contact me!